Team is the name of the game when it comes to sports – for the most part. Generally, plays are drawn-up, schemes are discussed and weaknesses of the other team are called upon. In golf, much of that changes and it’s about the player’s performance. 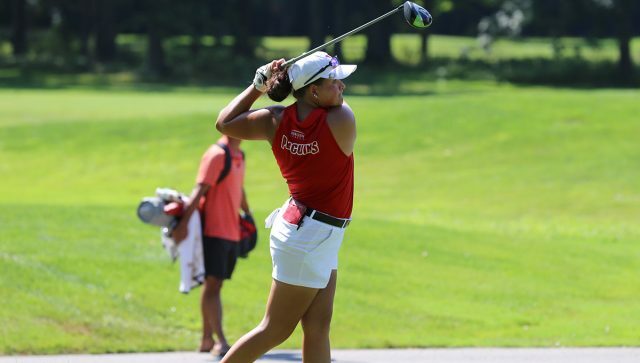 Even in one of the most individual-based sports that Youngstown State University has to offer, Katlyn Shutt, a third-year golfer with YSU, continues to put the team first and has become an unquestioned leader of the program. Shutt, a junior pre-pharmacy major from Dover, Ohio, has made a name for herself since starting as a freshman in 2016. In her freshman season, Shutt posted a score of 217 (73-71-73), taking home medal honors at the Horizon League Championship tournaments. During the fall of this season, Shutt earned multiple top-five finishes while maintaining a 74.2 strokes per round, a team best. She also broke the YSU record for lowest individual round after shooting a 64, eight-under-par. The record-breaking performance featured five birdies and two eagles, while leading the Penguins to victory as a team. While Shutt aims to improve her own game every day, her focus immediately shifted back to her teammates, continuously developing that leadership role. Though there’s no doubt of her leadership now, it was something Shutt had to adjust to. Courtney Shutt, Katlyn’s sister, was also a member of the YSU golfing family from 2014-2018. Being a leader is difficult and something Shutt had to adjust to. One person who doesn’t take it for granted is Nate Miklos, coach of the women’s golf team. Miklos is now in his sixth season as the Penguins’ head coach and counts on Shutts leadership on a daily basis. A difference that has had its ripple effects throughout the team. Shutt gives a lot of credit to Megan Creager, the lone senior on the women’s golf team. Because of Creager’s example throughout her four years at YSU, Shutt believes her role can grow even more next year. “Right now, it’s still kind of new, and I’m still looking up to Megan, but next year everybody’s going to be looking to me for guidance, and I think it’s a good experience now to not have all the pressure on me just yet,” Shutt said. Shutt fell in love with the game at a young age like most collegiate athletes do, but her game really elevated in high school. At Dover, Shutt was named the Eastern District Player of the Year after averaging 75.1 strokes per round. She also won a state championship during her sophomore year and was a four-year letter winner. For Shutt, high school was a place where her competitiveness began to flourish, much like it does today. Shutt tells us that she believes coaching is in her future and attributes it to Miklos and his staff and developing personal relationships with each player. Shutt says to be able to do that someday with others who respect the game as much as she does would be a great opportunity. However, with one more year left Shutt’s focus will continue to be out on the course, and of course on her team.